1/1943 Did 4 months of training for engine training in Columbus, Ohio off East Broad then off to basic training in Miami Beach, Florida. 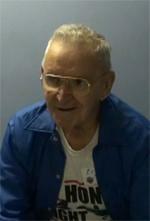 1944 Ermin was a mechanic on the B-17 flying fortress. He would work on any plane that needed attention until he was promoted to crew chief then he worked on specific planes. It would usually take five people to maintain one plane in flying condition. Engines would not need replaced very often unless they were damaged. 1944 Ermin was in England, France and Berliner, Germany. Ermin from time to time would get a chance to fly in the B-17. Often times Ermin’s base would be attacked by German planes and caused major damage. One event that were Ermin was scared to death was on Christmas morning 4AM when an attack occurred which was really bad. 1/1946 Came back to the States.